Here we will try to build some useful resources which will help with the identificarion and dating of old photographs, in Cambridgeshire and generally. Card mounts - Some thoughts on card mounts and dating. Cartes de Visite - an article entitled “Contemporary Press - Cartes de visite” by Andrew Wynter published in The British Journal of Photography, March 12 1869 and March 25 1869. An overview of the collection. Post Cards - some information and ideas on real photograph post cards. 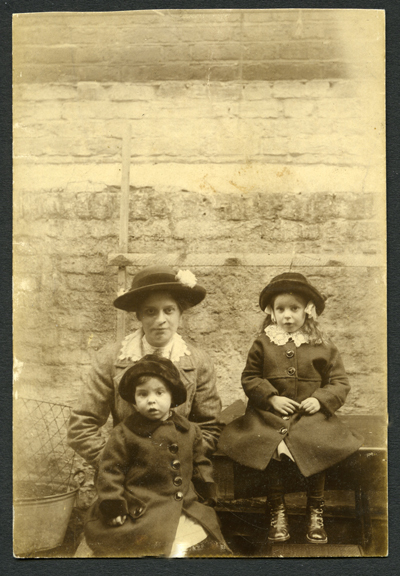 A photograph which has lost its identity, no date, no photographer's name, with post card back, divided back, the composition and expressions suggest that this was probably taken for a memento of the family for the husband/father serving in the armed forces during WW1.